With Slammiversary just a few days ago, Impact Wrestling rolled into Atlanta. It’s interesting now TNA doesn’t have another Pay-Per-View until October’s Bound For Glory to see how they book their weekly show over the next couple of months. They haven’t quite got it right yet, but hopefully they’ll settle into this new booking pattern which feels fresh compared to the bombardment of PPV’s we’re used to. The main event for the evening was booked by General Manager Hulk Hogan at the top of the show. 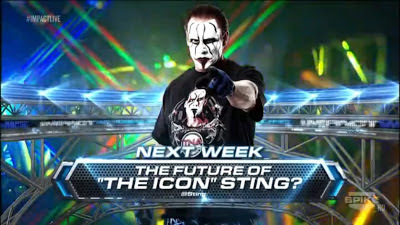 With Bully Ray talking up how he vanquished Sting at Slammiversary and talking about how Sting would probably retire, Hogan interrupted Bully to announce this match. Hogan seemed to have calmed down from his crazy ramblings at Slammiversary and both men delivered interesting promos. I much prefer Hogan in this simple general manager role, instead of having to get involved in every feud on the card. Now that was until Hogan announced the concept for the main event. A ladder match, I thought fine, I mean we already saw these two in a fantastic Full Metal Mayhem contest about a month ago, but it’ll still be an entertaining contest. Then Hogan added that there would be not a Championship on the line, or possibly Hardy’s place in the Bound For Glory Series, but of course a hammer! I had to quickly check if Vince Russo hadn’t been re-signed by TNA. In preparation for the contest, we got two backstage segments, the first with Bully Ray and Mr. Anderson. They discussed who would replace D’Lo Brown as the Vice President of Aces and Eights, with it being teased that Anderson would step into the role. Unfortunately, with Aces and Eights been made to look increasingly weak, the role really holds no real relevance, although hopefully it means TNA is starting to build up Anderson for bigger role on the show again, I’d expect him to enter the Bound For Glory Series and do well. We also saw Brooke Hogan talking to Taryn Terrell in which it was played up that Brooke still had feelings for Bully Ray. I’m not quite sure what Brooke adds to the product and how many viewers she’s bringing in, but I’m sure TNA could probably do without her probably expensive contract. The match was a pretty decent bout, although it was severely hurt by the nonsensical concept. Bully Ray’s heel character is extremely strong and he makes it very easy to hate him as he slowed Hardy’s fast high flying offence down and kept him grounded, including a superb back body drop, as well as working up the crowd with his Hogan impression. Although not quite as spot laden as their Full Metal Mayhem contest, there was still some interesting moments, including Hardy driving the Ladder into Bully Ray’s groin with a baseball slide, as well as Hardy taking a gruesome looking bump when pushed straight off the ladder, landing hard. Hardy is one of the only wrestlers in the main stream that I’ve seen take these kinds of bumps of the top of the ladder and one has to worry for his wellbeing if he continues with this kind of thing. After the bump, Ray went for the hammer, taking his time, the logic here seemed flawed as Bully Ray had Hardy down more than long enough to make a cover and win the match and if he wanted to hit Hardy with a hammer surely he could have had Mr. Anderson bring one out for him! Hardy quickly gained control of the weapon after a Twist of Fate and began swinging for Ray who managed to escape up the ring ramp. This was an unsatisfactory ending to the contest which really needed some definitive ending due to the concept and stipulation, this ending would have worked a lot better in simply a singles or maybe even a No Disqualification Match. However this wasn’t the end of Impact, as we saw Hulk Hogan creep up behind Bully with another hammer, only for Brooke Hogan to come to the Bully’s rescue. This was truly an awful end to Impact, as I question what Hogan was going to do with the hammer, was he planning to kill Bully Ray? Which is definitely not an avenue a wrestling show should be looking at in its storylines. It really is time to tie up the Brooke and Bully story as well, it’s been stale for a long time. Having been revealed earlier this week as Dixie Carter’s big free agent signing former UFC Light Heavyweight Champion, Quinton “Rampage” Jackson made his debut for TNA, in a heavily built up in ring segment. Now, I can’t say I’m a massive follower of MMA so couldn’t really comment on how much of a draw Jackson will be for TNA and what he will bring to company. There is obviously a lot of cross over between wrestling and MMA and a lot of fans follow both sports, so hopefully Rampage could bring TNA to some MMA fans who might usually only watch Raw or Smackdown. Rampage was seen prior to his entrance into the arena, backstage with new World Tag Team Champion James Storm and Gunner, which kind of depleted the impact of his entrance and made him feel a little less of a star. However, once he entered the ring and took the mic of Jeremy Borash, he sounded very comfortable with a microphone, although he was clearly still adjusting to his new surroundings. It was as he talked up his desire to be the best that Kurt Angle headed down to the ring. Fresh off a victory over AJ Styles and being announced as TNA’s second Hall of Famer, Angle said if Rampage wanted to be the best he’d have to go through him at some point. There was a real intensity in the ring between these two, reminiscent of Angle’s TNA debut and face off with Samoa Joe. It would seem TNA will go for a slow build for a contest between these two at Bound For Glory. It will be interesting see how much Jackson puts in to his TNA career, he clearly has some untapped potential, seeming charismatic and with his MMA background should be able to master the wrestling aspect well, but it really will depend on how much training he does and how willing he is to learn this new sport. Kurt Angle will be a great person to have his first match with as Angle is able to cover up most of his opponents weaknesses during a match and should be able to help Jackson with a number of elements of the industry. In the end though, Rampage Jackson will get as much out of wrestling as he puts in. Elsewhere we got the continuation of the Devon and Abyss rivalry, featuring Joseph Parks. Firstly, Devon came to ring to call out Abyss, with a competent promo about wanting the Television Title back because the loss was in an unsanctioned match, it was like TNA was trying to cover up its mistakes with this! He was of course met by not Abyss, but his “brother” Joseph Park who took down Devon straight away, only for Devon to get the upper hand and send Park to the outside. With Devon looking to take out Park, Abyss’ music hit and his video played. It was clear Abyss wasn’t going to come out as the man who plays him was lying on the outside of the ring! Devon announced if Abyss wouldn’t come to him, he’d go to Abyss, before taking one last shot at Park. With Park beginning to bleed it was made painfully obvious where Abyss was. There was then a handful of backstage segments, featuring Devon and fellow Aces and Eights member Know trying to hunt down Abyss backstage. Although Devon and Know were a little over the top at times, these segment weren’t too bad, but could have been cut down slightly, once the premise was opened it didn’t need repeating. With some nice camera Abyss appeared via shadow, to attack Knox, before going toe to toe with Devon and gaining the upper hand. He then said he was going to take the title “to the abyss”. I’m not sure what that was supposed to mean but it definitely didn’t come across as well as it did in whoever wrote it’s head. Hopefully, we see more of Abyss in the coming weeks and less of Joseph Park whose character has really run its course in TNA. There was also the continuation of Mickie James’ heel turn, which is progressing nicely. With Mickie’s false apology to Velvet Sky for not helping her last week, as well as putting down Taryn Terrell for making the save before she could, Mickie is looking more and more comfortable with this new character she’s working with. If she continues to work on this character and flesh it out a little, we could have a very good feud between James and Taryn Terrell, once James is finished with Velvet. Mickie was also in action against a returning Taeler Hendrix who hasn’t been seen since November. It really is one of the big problems with the Gutcheck challenge that the winners are left off TV way too long after their victories that it’s difficult to remember them or build any form of connection with their character and therefore future Gutchecks are diminished in importance as none of the other winners regularly appear on TV. The match told an interesting story with James attempting to run rings around Hendrix and patronise the newcomer at every turn, but with Hendrix more than holding her own. With Taeler looking to cause an upset by heading to the top rope, James feigned a knee injury by holding onto referee ODB, but once Taeler came to check on the injury, she got hit with an awkward looking Chick Kick for the victory. James really excelled in this role during this match and it’ll be nice to see where she takes it over the coming months, whilst Hendrix can more than hold her own in terms of in ring competition, hopefully she’ll be appearing more often on Impact in the near future. The Bound For Glory Series kicked off with two qualifying matches taking place. Firstly, we saw Former Tag Team Champions Hernandez and Chavo Guerrero square off in a decent contest. With a number of quick reversals this match was wrestled at a fast pace, as Hernandez showed once again he possesses a lot more talent that just his power. With Super Mex getting his knees up to block the Frog Splash from Chavo, a series of quick roll up attempt followed with Hernandez eventually stacking up Chavo for the victory. Although I think Hernandez is a talented in ring competitor, I can’t see him finishing very high up in the Bound For Glory series simply because every singles push he gets from TNA always ends up with him returning back to a tag team. The other Qualifying match pitched the underrated Robbie E against the beast that is Samoa Joe. With Robbie cutting an entertaining promo on his performance in last year’s Bound For Glory Series, however once Samoa Joe’s music hit there was only ever going to be one winner. Joe destroyed Robbie E, in little over a minute picking up the victory with a quick tap out to the Rear Naked Choke. I’d expect Joe to have another good showing in the BFG Series picking up wins over the guys lower down like Jay Bradley, and maybe some big victories, but slipping up in the bigger point matches. I’d love Joe to win it and get a major push, he truly deserves it after his work lower down the card over the last couple of years, and I just don’t see TNA giving him the chance in the Main Event scene anytime soon. There was also a six man tag team match pitting new X Division Champion Chris Sabin and new Tag Team Champions James Storm and Gunner against Bobby Roode, Austin Aries and Kenny King. This was a quality tag team contest with X Division competitors Chris Sabin and Kenny King proving they can hang with some of TNA’s bigger names, Sabin having an impressive sequence with Bobby Roode and Kenny King working well with Roode and Aries with some nice heel team work keeping James Storm in their corner. The ending came after a classic break down section of the match, with numerous wrestlers hitting signature moves on after another, eventually leaving Kenny King and Chris Sabin in the ring. With King missing a jumping side kick, Sabin planted him with a beautiful springboard spike DDT and finished it up with his Hail Sabin finishing move. It was a good six man contest that was worked well by all six men, unfortunately there was little in terms of storyline development between anyone in the match and felt a little like TNA trying to stretch out their feuds for as long as they can. What have we learned from this week’s Impact Wrestling? 1. TNA hasn't quite got it's new pacing sorted, with just four pay-per-views a year to build towards. 2. Hulk Hogan wants to murder Bully Ray! 3. TNA isn't going to miss Todd Kennely on commentary, I barely noticed he'd gone! Announced for Next Thursday's Impact Wrestling.